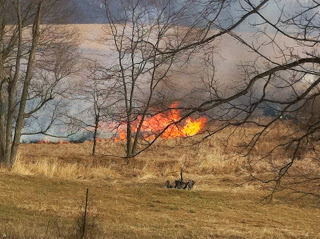 Sunday was a great day for a grass fire. No, not that kind of grass, although wildland fires can make your day go to pot. 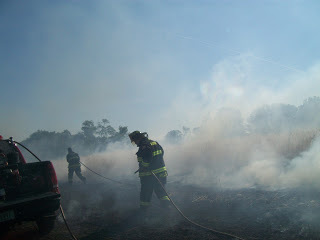 We once pulled up to a field fire that was burning around three sides of a house. When we knocked on the door to alert the occupants, this guy opened up and told us it was a controlled burn, and the fire department wasn’t needed. He was wearing a towel. Yes, he’d been in the bathtub. This is not the definition of a controlled burn. Meanwhile, one inch above that wet ground, anything that’s been dead since last fall dries out after about an hour of sun and breeze. I’ve seen six foot flames burning over standing water in swamps. That’s me on the other side, waiting on the shore for it to get to me … I’ve seen all those SyFy movies with mutated alligators. So I looked at the weather forecast last week and realized the next day would be perfect for what we call grass fires. (At least until they get to other stuff; then we call them house fires, barn fires, car fires, unwanted relative fires, whatever.) It would be a Sunday, sunny, with a temperature in the low fifties. There would be just enough of a breeze to spread fire, but not enough to make people worry about it. We’re a small town volunteer fire department, and we still once made 17 calls in one day under those conditions. 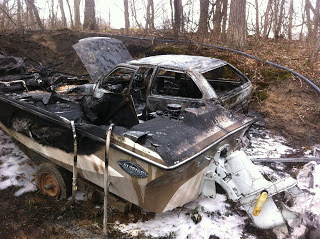 Grass fires spreading to cars are pretty common. Boats, not so much … but as you can see, it happens. So, instead of the pajama pants I usually wear around the house (days off equal writing time on the couch), I put on jeans–and socks, and since it was only in the low fifties, a sweatshirt. I put my shoes right in front of the couch. The keys were on the ledge by the front door, the car backed in to allow for a quick entrance, my pager on my belt. As busy as my life’s been lately, it’s probably the most prepared I’ve been for a call in ten years. Then I listened, as surrounding departments started getting called out. 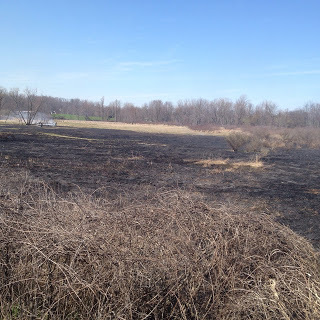 Kendallville FD, grass fire; Cromwell FD, grass fire; Noble Township FD, grass fire; Avilla FD, grass fire; Ligonier FD, car-pedestrian accident. Also unexpected: The Albion Fire Department, with is 96 square mile, mostly rural response area, didn’t get called out at all that day. Just a grass fire? When crops like wheat catch on fire it does honest to goodness financial harm. The aftermath. It was totally under control, then came the running and the panic and the 911 calls.